Moriones Festival is an annual religious festival held during Holy Week (starting Palm Sunday up to Easter Sunday) in my home province- Marinduque. During the Holy Week, the streets of Marinduque come alive with scary-looking masked people who are decked in a replica of the garb of biblical Roman soldiers. The festival re-enacts the seven-day search for Longinus. Men and women wearing mask and costumes replicating the looks of a Roman Centurion are called Moriones/Morions. They usually roams in the streets searching for Longinus, and also serve as their way of "Panata"(devotion) or "Pagpapahirap sa Sarili"(penitence). Moriones came from the Spanish root-word morion which means mask. Below is the unofficial festival schedule of activities in the Capital Town of the Province - Boac, Marinduque. Don't forget your camera! 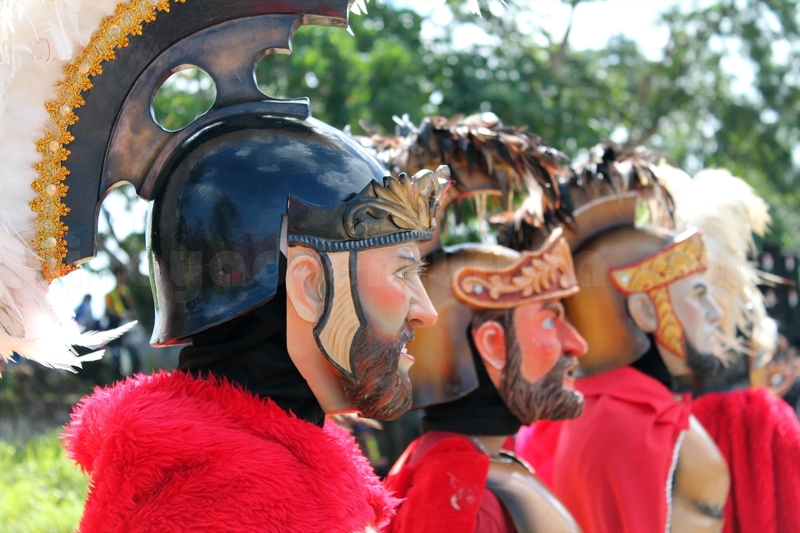 Moriones Festival is one of the most colorful religious festivals in the Philippines. From Metro Manila, ride in a bus bound to Grand Central Terminal of Lucena City (Quezon) where passenger jeepneys and tricycles bound to Talao-Talao Port are available. To avoid the hassle of transferring from one transport to another, better to find buses with direct route to Talao-talao Port. Travel time from Metro Manila to Talao-talao Port is approximately 3-4 hours depending on traffic in Laguna and Quezon. From Talao-talao Port, there are RoRo vessels and fastcrafts with regular trip to the island province. Take note that there are 3 main ports in the province – Buyabod Pier (Sta. Cruz), Cawit Port (Boac), and Balanacan Port (Mogpog). Travel time ranges from 3-4 hours for RoRO and 2 – 2.5 hours if via fastcraft. No airline servicing Manila-Marinduque route as of the date this post was published. I never seen a Moriones Festival.. It looks awesome! If you're looking for a place or resort to enjoy your Holy Week Vacation in Marinduque, you may try ROBERTO'S HIDEAWAY BEACH RESORT (formerly known as R Hideaway) located at Brgy. Cawit, Boac, Marinduque.